In early February, the web publication New York Upstate announced that Community Beer Works in Buffalo is resurrecting Iroquois Beer. 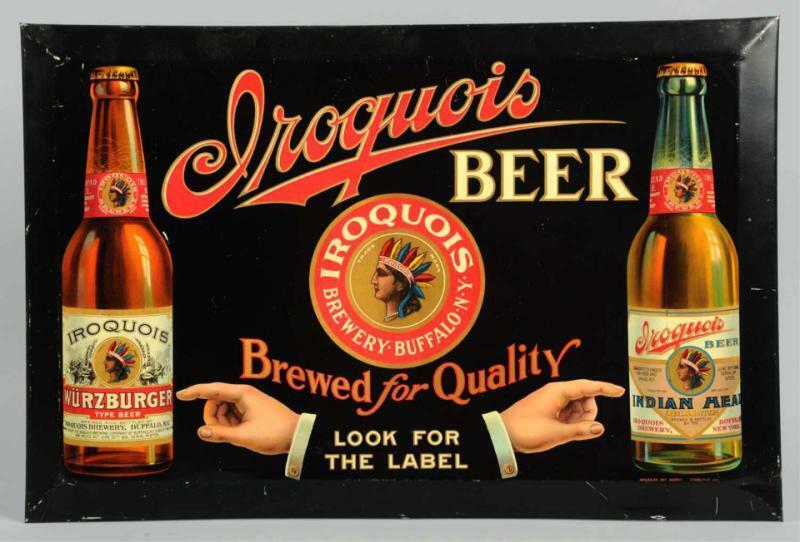 “If you grew up in a beer-drinking family in western New York,” Dan Cazentre’s story reads, “chances are good that your grand-parents, your parents and maybe even you yourself once drank Iroquois Beer.” Iroquois Beer souvenirs can still be found in Buffalo-area curio shops, and the original Iroquois Brewery was the city’s largest when it closed its doors in 1971. As such, Cazentre noted, there is considerable excitement about the return of Iroquois Beer. Hipsters rejoice! But there is concern as well. There is, of course, a long history of non-native business people using Native American motifs, images, and iconography in their marketing plans and product design. In my classes, I used to assign Michael Brown’s book, Who Owns Native Culture, which explored the subject with grace and style. What happens, for instance, when multinational pharmaceutical enterprise attempt to bring to market new drugs based on remedies that are part of a native people’s traditional knowledge? What happens when corporations derive profits from imagery they have appropriated from native cultures? Brown examined these issues in all their complexity. Though I no longer use Brown’s book–in some ways, it has fallen a bit out of date, and there are so many things I want my students to read–I do still discuss issues of appropriation and exploitation in my classes. Iroquois Beer, because it is so current and so close to home for many of my students, will work nicely this semester to serve as the basis for our discussions. No member of any Haudenosaunee nation was consulted about the decision to bring back Iroquois Beer, and so it is disrespectful towards native nations. Furthermore, the petition’s sponsors argue, the practice of using native images and native peoples in marketing is harmful, especially for Native American children. You all are invited to join in the boycott of Community Beer Works’ products, and I intend to show the document to my students, and discuss it in class. But we will discuss the issue critically. As Brown suggested in his wonderful book, some of this rhetoric might be a bit overblown. Resurrecting the Iroquois brand might be harmful to children, and it might be completely “reprehensible,” but so was the recent verdict in the trial of Colten Boushie’s killer, and the recent acquittal of Raymond Cormier, accused of killing fifteen-year old Tina Fontaine. Let’s deploy our outrage in appropriate measure. Boring a pipeline under a Native People’s principal water supply, and the growing numbers of missing and murdered indigenous women and girls, and New York State’s endless campaign to skim the cream off of any prosperity that comes to native communities, might be more reprehensible than the restoration of a nostalgia beer brand. It might be a stretch to suggest that native peoples who have survived and endured after military invasions, consecutive epidemics, coercive dispossession, forced relocation, and systematic efforts to forcibly eradicate their culture, would be seriously damaged by a new craft beer. There are, I tell my students, twenty-four hours in a day. My job takes up a lot of my time, and I have a large family. I have to choose my battles. They will have to choose theirs as well. The Mascot Issue, cultural appropriation–they are emotionally painful issues, but they can be remedied. But there are other problems out there, more dangerous, more damaging, for which solutions are more elusive, and progress much more slow. I am looking forward to this meeting in a couple of weeks.